Not every cake has to be an extravagant ordeal. Sometime uncomplicated is better. 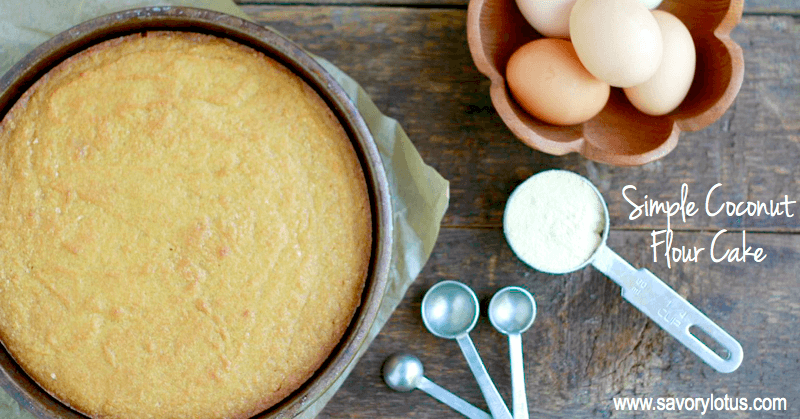 I’m on a mission to create a Simple Coconut Flour Cake that is not dense or too eggy. Is it possible with coconut flour? Yes, it is! If you have ever baked with coconut flour, you know that it is not like other flours. It is EXTREMELY absorbent and requires a totally different ratio of fats, eggs, and liquids than regular flour. Don’t even try to substitute coconut flour in your favorite cake recipe 1:1. What you will end up with is a dry, dense mess. Believe you me! But all is not lost. With a bit of creativity and experimentation, it is possible to make a simple white cake that is fluffy and light. Now I’m not talking angel food cake light here. It IS coconut flour after all. But this cake is the closest thing that I have had to regular white cake using my favorite grain and nut free flour. Like I said, this cake is a simple and basic white (well, actually yellow) cake recipe. It’s mildly sweet and will go well with any amazing frosting or whipped cream/coconut cream that you like. It makes a perfect cake for any birthday celebration or for strawberry shortcake. The trick to making it fluffy and light is to fold in some egg whites just before baking. I learned that from GOOGLE. Seriously, I did. GOOGLE pointed me to this post on whipping and folding egg whites. See the end of this post for frosting ideas for this lovely cake. Thanks for the mention – your cake looks GREAT! I am very excited to try this recipe! Because my husband has diabetes I try not to use any type of sweetner other than Swere. Can I substitute Swerve for the maple syrup or honey? If so, do you have any idea how much Swerve I should use in place of them? Otherwise, can I substitute liquid Stevia? And again, do you know what the substitution amount would be. I appreciate every one of you ladies (and men) out there that spend countless hours testing all of these recipes and coming up with something really great AND healthy for the rest of us! Can I use applesauce in place of eggs? I’m an experienced baker of coconut flour goodies sweetened with xylitol and/or erythritol. When I convert a recipe that calls for sugar, I substitute the same amount of xylitol. However, I use my super high speed blender or any device that can grind, and I powder the xylitol. So if this recipe calls for 1 cup sugar, I use one cup powdered xylitol. It works perfect every time. I’m going to make this cake tomorrow using all xylitol and I made Martha Stewart’s easy pastry cream recipe, but used all organic ingredients and grass fed organic milk and butter. Came out just like if I had used real sugar. I found a decent thick chocolate fudge coating that uses xylitol so I am going to make a Boston Cream pie. I will report back and let everyone know how it turned out. Thank you to the website for the recipe. I am interested in make this cake for a friends 50th birthday. I would like to use a 10 inch round angel ? food bunt pan with the hole in the middle. Can you please let me know what the measurements would be? I wasn’t sure if I should double the ingredients. I know this cake will be delicious and I can not wait to make this for my friend. I have not tried this in an angel food bundt pan. This cake recipe is a pretty small round cake. You could definitely try doubling the recipe. But this cake does not rise like a normal angel food cake. Please let me know if you try it. Do you have a website? I need coconut flour recipes that are dairy free AND keto compliant and I just don’t know how to modify this recipe (to make it without the honey) and have it come out right. I’m pretty desperate for help. I have cancer and I could use a treat once in a while and my husband has MS and is trying to stay committed to the keto diet with me but he craves desserts once in a while too. Look at the you tube channels “keto connect”, “ketogenic Aline” & “headbangers kitchen”… Aslo “healthful pursuit” for ideas. Try stevia to substitute for other sweeteners (including honey & sugar). It’s VERY sweet (nearly 300X as sweet as sugar) so you won’t need nearly as much. Yes it bakes/cooks well & heats well. I like using the liquid “better stevia” produced by Now brands. Xylitol tastes like sugar and is good for your teeth! But it causes an insulin reaction like sugar & is VERY TOXIC TO CATS & DOGS. For glucose-sensitive conditions (like most cancers are) it may be appropriate but I urge caution & learning about the metabolism of Xylitol in YOUR body & human bodies in general. There is also a sugar free maple syrup that is really good. I bought some at the local grocery store. The only problem is sugar free maple syrup often have xylitol as the sweetener and it’s derived from corn more often than not. Because of severe health issues I can only use BochaSweet. Maybe someone can figure out how to modify this recipe using only xylitol (BochaSweet can be substituted 1:1 for xylitol) and no honey. I don’t understand this recipe….there is nothing to activate the baking soda, it doesn’t just work on its own, it needs an activator, like vinegar or buttermilk, so whats the point of the non activated baking soda, other than adding questionable chemicals to the body? Is this just an uneducated random recipe without science or chemistry behind it? Gosh doesn’t anyone bother to learn the basic science of baking or does everyone just sheepishly follow along and reprint uneducated recipes? Gee thanks for that. I usually don’t respond to folks who feel the need to be rude to me on my platform. But I would just like to say that maple syrup and honey are both considered acids that help activate baking soda. Using either one of them has worked fine for me – and I have hundreds of tried and true recipes on my blog. In the future, kind words and understanding go a long way in creating goodness and community. Thank you to everyone who has made this recipe and left feedback. I do my best to create user-friendly recipes that everyone can make. I am actually wondering if some of the folks who have had issues with this recipe are using other things than maple syrup or honey. If this is the case, a simple 1/2 tsp of apple cider vinegar can be added to help the baking soda do it’s job. Big love, everyone! I hope that you love it. Happy birthday. How sweet that your man is baking you a cake. I am excited to try this. Is it possible to use a dry sweetner with this recipe like xylitol ? Did you try it with just xylitol for the sweetener? Could you please post the modified recipe here? I’m very desperate for a DF Keto cake recipe. If I wanted to make a bundt cake instead of a 9″ round, would the temperature and baking time be different? I love baking with Coconut Flour. Once you conquer the egg/liquid ratio it makes beautiful cakes; just like this one! I’m getting the hang of it too! It has been a steep learning curve but finally making nice coconut flour desserts! When I made this cake it came out soooo oily. What did I do wrong? I used half a cup of coconut oil as stated in the recipe. It looked like much but I didn’t want to deviate from the recipe. Hi, Joy! Not sure what happened. I use 1/2 cup of oil because coconut flour is VERY dry and need lots of egg, oil, and liquid to be just right. My cake does not come out oily. Sorry to hear that! I made this cake and LOVED it!!! I added lemon oil to this recipe and will likely do that again when I make this next. I accidentally used 3 egg whites instead of 2. My cake came out really moist, which was good, but next time I’m going to try just 2 egg whites. I used some honey, but mostly maple syrup to make up the 1/3 cup. I used mostly butter and some coconut oil for the fat. Emily, so glad that you liked it. I am going to try it with lemon oil next time. Sounds yummy! hi. I am little disappoint that my cake didn’t come out. I did everything by the recipe and it didn’t rise at all. Did step by step. I’ve been using coconut oil and flour for years. This is the first time it didn’t come out. When I read the recipe I questioned why there was no baking powder listed, but went along with the written recipe. My disappointment because the cake did not rise. Why is that ingredient not listed? Your cake probably didn’t rise because of the baking powder. I noticed with baking coconut flour desserts that my baking powder has to be new or very fresh and purchased within the previous three months. Just an idea. Could this be because of something with the baking soda? I know when I bake sometimes, my baking soda isn’t fresh, and so it doesn’t give any rise to my cake. Hi, there! Baking is a finicky art. Wondering how you measured you coconut flour? I use the scoop and sweep method. I also measure my oil once it is melted. I wish I could see you r cake so I could help you problem solve. I haven’t tried it with light. I’m sure it would work but not sure it will be the same consistency. Please let me know if you try it. This cake was delicious!! I made it with the “Best Paleo Frosting Ever” that you link to. I’m going to make it again on my birthday with caramel frosting. Thanks so much for the recipe – even my non-Paleo husband and friends loved it! Thanks so much, Kelly, for the kind feedback. So glad that you guys enjoyed it. This cake is so versatile. Sounds amazing with caramel frosting! Hi. I love the idea of using coconut flour for cake. I am looking for a cake recipe to replace the recommended boxed yellow cake mix for a bundt cake. How do you think this recipe will hold up for that use? It will have pudding injected into it at the end (and I am also looking for an appropriate recipe for that). I have not tried this recipe as a bundt cake injected with pudding. I would love to hear if you do. I measure my coconut oil AFTER it is melted. I have found that unmelted, it is more oil. Made this cake now and it was so good.i used almond milk cos I didn’t have coconut milk and it came out really good except it didn’t rise. can you please clarify, are we talking 3 whole eggs and two egg whites? or are the eggs separated and the yolks only used in the wet ingredients? This recipe reqires eggs and will not work without them. Sorry! Baking with coconut flour is difficult without eggs. 🙁 Thanks so much for coming by. Personally I have found if you the cake ingredients together in a blender or food processor cakes turn put awesome. Even a hand mixer is great… But the key is… The longer you mix the more light it tends to turn out. I try to mix for about two minutes. Thanks for the tips! 🙂 and thanks for coming by! That’s funny – I’ve found the opposite to be true. If I blend it or even over mix my eggs with my coconut flour, I get weird spongy cake. Yes, of course! You can make this in any pan that you like! Thanks for coming by! I do not have canned coconut milk but I do have So Delicious coconut milk beverage. It is sweetened some and flavored with vanilla. Could I sub this for the coconut milk in your ingredient list? The boxed coconut beverage is a completely different consistency and will not give the same results. Canned coconut milk is thick and creamy. 🙂 and this gives this cake a rich texture and taste! 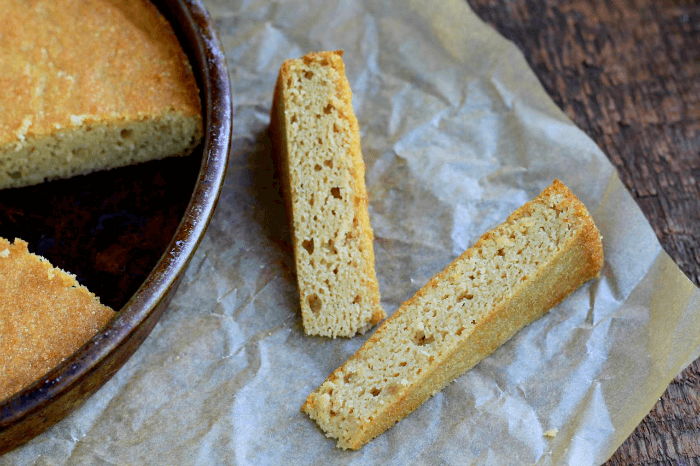 This is the best coconut flour recipe I have tried – REALLY good! And so forgiving… I was interrupted after mixing the dry and wet ingredients together and when I got back to the kitchen, the mix was a bit on the dry side. I went ahead and put it in the pan and popped it in the oven where it sat for about 4 minutes – until I realized I hadn’t added the coconut milk! (Dang interruption really scrambled my brain). I frantically pulled the cake out and mixed in the coconut milk right in the pan even though it had begun to rise already. Amazingly it turned out soooo good. Thank you so much for this recipe! Diabetic husband raved as well. Yay! As excited as I was about this, it didn’t turn out well. The cake was too dense and heavy and oily. Not sure what went wrong. Hi, there! I am learning that coconut flours vary significantly in their rate of absorption from brand to brand. I usually use the Nutiva brand for this recipe, and it works beautifully. And also, be sure to measuring your oils once they are melted, not solid. This could make a difference. I think I’ll add some berries next time or put some rhubarb and apples on the bottom. Just baked this cake. It turned out great. I used a bundt pan . The cake was ready in 25mins @ 350F. My family enjoyed it. Thanks for sharing a great recipe. I have not baked in 10yrs,…my cakes always turned out too dry or burned .So i thought I would give it ago again, sine ive been using coconut for EVERYTHING( cooking, body and hair) I thought I would use coconut flour. I went through so many recipes on the internet and finally came aross this one which didnt look so scary or elaborate. I can honestly say that ths recipe has given me some hope that I might be actually able to bake. Im sitting here with super tasty home baked coconut cupcakes. Thank you for sharing this recipe, and for any bakeaphobe wait to have your baking world open! I’m trying the recipe for the first time today. Is it normal that the batter turned a tad dry? Should it be more liquid? My guess is that you added a titch too much coconut flour. You g=have to be very careful when measuring as coconut flour absorbs so much liquid. Just do a gentle sweep and scrape. Make sure it is not packed tight. It takes a bit to learn to work with coconut flour. If it is too dry, you will want to add a bit of liquid. I want to use the whole eggs which includes the yolks in this recipe. Will this be ok? Hi! I’ve made this successfully MANY times (after one botched attempt when I forgot to whip the egg whites. it still tasted great, just didn’t rise. at all. ha), and I’m looking to try it as a cupcake recipe. Any thoughts on cook time/temp?? Made this tonight and from the looks of it, this cake is verrrrrry moist and dense. If I wake up early enough I’ll try it again for a second layer. The egg whites wouldn’t properly combine, but maybe my food processor bowl wasn’t dry enough for whipping. Hope it goes over well tomorrow for a birthday cake. Thanks for the recipe! Just made one today for my special needs son’s birthday. He requested a strawberry cake w strawberry frosting. So, I added about 1/2 cup of strawberry puree into the batter, and bake in a 6″ cake pan. Took me an extra 15 minutes of baking time. Cut in layer half, put in another 1/2 cup of strawberry puree into the layer, and then frost w strawberry frosting (coconut cream from a can of coconut milk – the cream part; add a teaspoon of vanilla essence, and 1/4 cup strawberry puree, and 1/2 teaspoon of honey). It was yummy. My son needs to be on limited carbs per day, so the cake and the frosting were both reduced the honey. Bookmarked this recipe. will be using it in the future. thank you. Thanks for these notes. I’m hoping to make this for my boy’s 1st bday. I have a 6″ pan as wel and was thinking of splitting the batter between 2 but may do the one and just cut it. He also LOVES strawberries so I may add that as well! Hi, there! Yes, I use a finely ground coconut flour. Sorry to hear that it did not work out. This is by far the most popular cake in my family. We make it often. I wish I could be at your house so I could problem solve. Dessicated coconut is different than coconut flour. Dedicated coconut is like tiny little pieces ground up pieces of coconut. Coconut flour looks and feels almost like regular white flour. You can’t use dedicated coconut flour in this recipe. Hope this helps. Used your recipe to make gluten free cake pops, worked out really well! Didn’t need to add any frosting/coconut cream etc as it was oily enough to hold together on it’s own! It was my first time cooking a recipe of yours….As I live in Brazil, fresh coconut is available everywhere along the coast and in big cities – it is THE cake for us! I had made some coconut milk that had to be used, bought more oil and had grated coconut (which quickly was transformed into finelly shredded coconut). I used a teaspoon of xantham gum and agave instead of honey today at 6am: it is absolutely impossible to stop eating the golden cake (still wondering why so golden) that was out from the oven! Fluffy, simple, fast, perfect for snacks and tiny hands! Thank you A LOT for sharing! Hi, I’ve some Koko Dairy Free spread (45% vegetable fat, 26% coconut oil) – do you think that will work in place of the ghee/coconut oil? Thanks! The cake didn’t rise very well at all though… coconut flour just doesn’t rise maybe? My cake did not rise – I saw in comments some notes about coconut oil that may be the culprit. Do you melt it and then measure 1/2 cup in a liquid measuring cup? In all my other baking endeavors its usually measure in a dry measuring cup and then melt. Please let me know if this could have prevented the cake from rising. Would like to use this for my son’s 1st bday cake in a few weeks! It’s been so nice we actually doubled up on the ingredients and make two whole cakes and it comes out perfect. Thanks for the feedback! So happy that you liked it! 🙂 We love this cake too! Brilliant recipe, turned out well. Although the top was a bit peaky and the highest bits of the peaks browned a bit much. I’m new to gluten free, being used to baking regular Victoria sponge where the cake settles and evens out in the oven. Must smooth it on top more before it goes in the oven next time. My oven is in Celcius so I baked at 180C. I made this cake and it came out OILY!!!!! I followed the measurements to the T. I doubled the recipe, and made sure that everything was doubled. Why did it come out oily?? What a waste of ingredients. It’s edible but I don’t want to be eating a lot of fat from coconut oil (I maintain a set about of macros for my diet). I just made it and it was PERFECT!!!! Now I just need to add some chocolate chips ?. What’s the best way to do this? This recipe made a spledid birthday cake for my husband! I am so thankful I found the recipe and will continue to use it, especailly on special occasions! Being that I was making it for the first time, I did get a little nervous, though, because I had sifted the coconut flour mix, as suggested… the sifted mixture looked extremely fine and I looked at the bag the coconut flour came in and it stated it was already finely ground. I thought, uh oh, I might have ruined this…. but, I continued to mix all of the batter. And put it in the oven. Thirty minutes later, I pulled it out and it turned out beautifully! Later on, I iced it. That evening the whole family ate it and enjoyed every bite! It was yummy, moist, and very similar to a yellow cake. Thank you for sharing this recipe! So excited to try this…butI do not have coconut milk! My son is napping and I was just about to dive in since his birthday is today! Think I can substitute with whole milk? I could add a little sour cream for thickness?? Tried this recipe. Delicious. Put a little whip cream on top. Yummy. Does anyone know how many calories? Hi , Can I use coconut butter in place of the fat in this recipe? If so, would I replace 1:1? Hi I’ve made this recipe 3 times and every time it was DELICIOUS !! Thank you soo much! I have a question, I’m out of coconut milk right now, can I replace it with actual milk? I ran out of coconut milk and used full fat whipping cream since it’s a similar consistency. It’s delicious! Perfectly yummy with a density like pound cake. My cake was quite brown on the outside all around, but golden on the inside and didn’t taste or smell burnt. I don’t know if that’s the milk? Can you use raw regular whole milk instead of coconut milk? We tried this today and it is lovely. One of the best coconut recipes I’ve ever tried!!! Was easy, not full of lots of ingredient and tastes great. I made this cake for my son’s 1st birthday and my son and husband loved it! Nice and moist, but not too dense, which is usually the case with the coconut flour.. I used less honey but still it’s fine. Thank you for sharing the recipe!! I am so glad everyone enjoyed it. Happy birthing day to you, mama! <3 Thank you for taking the time to leave some feedback. Hi Katja, i am waiting for my cake as it is in the oven, not sure how it is going to turn out as the texture seemed very thick, i measured all the ingredients as you suggested, apart from the coconut flower which i think i pressed too hard in the measuring cup, would be great if you would add the info about the scooping it lightly into the actual recipe so one doesn’t dig for info in the comments bellow. also a suggestion the photo recipe would be really helpful to show off the texture before baking. Oh, My Gosh was this an amazing cake! Thank you for sharing this recipe with us. I made it today and love it. I started mixing it up and found out that I was out of vanilla, so I used the same amount of lemon juice instead. I also lined the silicone pan I was using with parchment paper and used sliced apples to help hold the paper in place. Then I just poured the batter over the apples and cooked for 35 minutes. The results were great! So glad that I found this recipe! I have put the recipe that I ended up using below if anyone would like to see it. Again, Thank You! Preheat oven to 350’F. I used a silicone baking dish & took a sheet of parchment paper and put it in the pan loosely, putting it to all edges and creases. Now place the sliced up apples into the baking pan, and this will also help to hold the parchment paper in place. In another bowl, beat the egg whites with a hand mixer until thick soft peaks form. Now gently fold the egg whites into the main batter. Bake for 30-35 minutes, until toothpick inserted into center comes out clean and cake is golden. I am not a baker by any means. I did have numerous mishaps making this cake but nothing to actually do with the recipe or the cake itself! 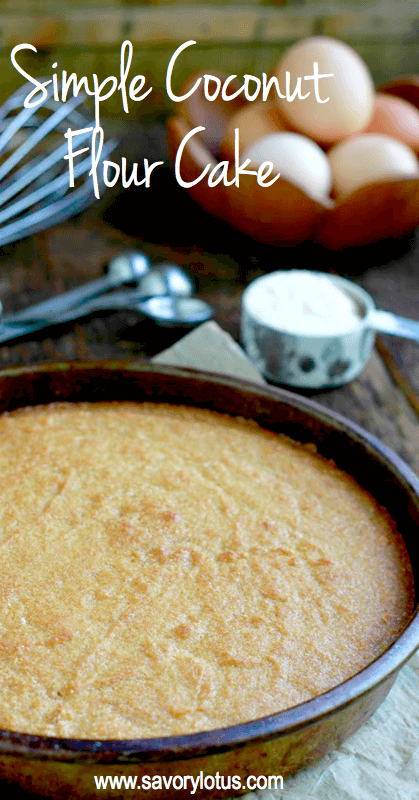 I digress – this cake is so simple that even I could make it and it is really delicious. I would definitely use this recipe again, however I would probably use a tad less honey even though my mom, who’s birthday the cake was for, loved it how it was. I also felt it was a little too moist but that’s possibly due to the honey, it was not dense at all. I live in a tropical country but ironically coconut flour is not so common. I’ve learned to make my own. One thing i’ve learned is to always airate the egg white and slowly fold it into the batter. This will make the bread less dense and can be fluffy depending on the amount of coconut flour used. I’m following keto so coconut is a staple of my diet (almond is very expensive here). Preheat oven to 350 with a cookie sheet inside(to put the cake pan on when cooking, it helps with browning) Separately stir wet and dry ingredients then mix together. Take a sheet of parchment and fit in an 8 inch cake pan (there needs to be enough parchment on the sides to lift the cake out after baking). Put “batter” in the cake pan and bake for 35 minutes. The cake will be browned ontop, but if you tap it, it will seem squishy and that is okay! Recipes using coconut flour and chia seeds are always better the day after sitting in the fridge all night, so lift the cake by the parchment and transfer to a gallon ziplock bag and let sit in the fridge overnight or else it will be a soft crumbly mess! The next morning I broke up the cake pieces and mixed it in with coconut yogurt and it was delicious, especially for no added sweetener! I am pretty sure it would work well with 3 gelatin eggs (probably the best with flax eggs) so feel free to experiment! Thank you for the recipe! After reading some of the reviews I’m excited to try this. Do you bake other things with coconut flour? I couldn’t get the egg whites to fluff (too lazy to beat so threw them in the Thermomix without the butterfly – liquid as!) but added it to the mixture anyway. I thought it would be an epic fail. It wasn’t. It was the most delicious cake!! My husband ate half of it in one sitting. I did substitute the maple/honey for rice malt syrup but the taste was beautiful. Saving this one. I made the cake. Doubled the recipient and baked two 9 ” pans. While it could in exactly 28 minutes around rose beautifully in the pan, the spunky cocsistency was quite oily. Not sure if it was the brand of coconut flour used. Will try it again, will let you know the results. I believe if people use Bob’s Red Mill Coconut Flour, this is why it comes out oily. Thanks, Krystin, for the feedback. I have never used that brand before. I will have to look into it. Because my cakes always turn out beautifully!! Hmm was about to make it with this brand of coconut flour. Anyone figure out a solution? It would be nice to see pictures of the end result, and possibly pictures with the step by step method, having not made a cake like this before, I was not sure of the consistency of the batter! Does the cake rise, or about the same as it went into the cake tin? My cake is still cooking in the oven, so my rating for the making of the cake only. It was easy to follow the recipe. Do you think I could make this a couple of days in advance of serving? Perhaps kept in the fridge or freezer sealed in cling film? I find that coconut flour baked goods are best served as fresh as possible. If you make it the day before, just cover and leave out on the counter. Once in the fridge, it will take on more moisture. Yay! So glad you are liking the recipe…. and experimenting on your own. That’s what I do too. I take other recipes and change them up to suit my tastes. Thanks for sharing! Amelie- did you juice and zest one entire lemon? Did you use the lemon in place of anything else or just add it to the rest of the ingredients? Did it change the density or the texture? Thanks!! I made this recipe as cupcakes for a friend’s birthday. I cut out the center of the cupcake and filled them with some cooked mango bits, and made some frosting with coconut oil, coconut cream, and powdered sugar, and topped it all with some shredded coconut. Not entirely Paleo with my additions, but EVERYONE loved them! The tops of the cupcakes did brown a bit more than I would have liked, but the taste and texture was amazing. I’m already planning on making a layer cake with this recipe over the weekend!! OMG! The mango part and cream sounds divine. Thanks for sharing!! I tried it again with lemon pie filling in the middle, another huge hit with everyone! Thank you for such a great tasting recipe! This is the best paleo cake I’ve ever tried to make. So simple! I knew the tin that I was going to be using was a little too large (and square, I must invest in a decent round tin for my next attempt) so the cake is not very high (one and a half centimetres) but it tastes absolutely delicious with a superb texture, perfect! Yay! I am so glad that you liked it!! I use ghee and coconut oil. You could also try butter. Those are basically the 3 fats I use to bake with. 🙂 Pink salt is fine. This cake was amazing. I’m quite the experimenter so I added 2 scopes of vanilla protein powder. I added with a little heavy cream to add moisture back. I only measured by eye, and I would say it was 2 table spoons. I didn’t heat the coconut oil before measuring either and it came out great. My point of mentioning all of these notions above, it to highlight how great your cake was, even with not being so strict to the recipe. I love cake with white flour and this was the closest tasting cake to that. It was fluffy, most and soft. I finished the cake with a half cream cheese//Greek yogurt vanilla frosting. I am new to the Paleo world and I’m so happy to have tried this. Thank you. Thanks for all of that! Glad you liked it!! Oh, yay! I’m so glad you liked it. Your mousse sound amazing! I am sorry to hear that. This cake does not rise as much as a “regular” cake but should rise. Not sure what happened. I make this cake on the regular without any problems. Thank you so much for this recipe! It looks great! I have my kids party coming up soon and I was wondering if I can use this recipe as a base for making a gluten free rainbow cake. I thought about dividing the dough into three seperate bowls, adding the food colouring and then baking separate colour layers, stacking them with buttercream, etc. Do you think this could work? Hi! This recipe makes one thin cake. You would have to triple to recipe. I have never tried adding color to the cake recipe. Would love to hear how it goes. And I would love to see it!! When I melt my coconut oil and it cools I end up with coconut oil chunks. Is it supposed to cool or do I just need to hurry. Five stars ! I baked a cake first time ever in my life and it came out so well. Soft and just right. Thanks. I added cinnamon powder for flavour and used Avacado and honey paste to decorate. 1) There is a Coconut Oil that is refined by Nature’s Way in a bottle: https://www.amazon.com/Natures-Premium-Liquid-Coconut-Ounces/dp/B008YQKZ3O/ref=bit_abba_def_ie_us_title/131-4577816-6307701?_encoding=UTF8&ascsubtag=1ba00-01000-org00-def00-other-nomod-us000-pcomp&tag=amz-mkt-edg-us-20&tagbase=abba&th=1. Could that be substituted for the virgin coconut oil that needs to be melted? Also, I just want to let folks know that the Coconut oil (Virgin) you are using is not the same as Raw Coconut (Oil) which has the fiber in it at the bottom and is sometimes referred to as Coconut Butter. It will burn if one tries to melt it (the fiber part) but is otherwise delicious as a spread on bread, muffins, toast, etc. The top part of the raw coconut might be okay to melt however since it is more like the virgin coconut oil. Now per the Canned Coconut MILK (it might be wise to state in the recipe that the coconut MILK is canned since there are lots of coconut milks on the shelves and state in parentheses that it’s not coconut Cream. My 2nd question is: does one use the whole can of coconut milk in the recipe, which includes the small/thin amount of cream at the top along with the clearer coconut water/milk underneath? Thank you for sharing this recipe! I was struggling to find something for my birthday this weekend but this looks delicious! I cannot wait to try it. Hi Katja, I am a diagnosed coeliac and have been gluten free for over 10 years now. I’ve just discovered coconut flour. I have altered and tweaked many recipes to convert them to gluten free. I can’t wait to try your ‘Simple Coconut Flour Cake. The ingredients list looks healthy. Thanking you in anticipation. Regards, Michaela Gibbs Holroyd. Could I double the recipe if I’m wanting to make multiple layers? Just baked this cake tonight for the 1st time, and it came out great. I doubled it, and put it in a 9×13. Used honey and maple syrup. It was done in about 22min, and came out pretty brown on the sides and bottom (but was not burnt). Hubby, toddler and I loved it! Very moist, and surprisingly light for coconut flour. If i wanted a chocolate cake using this recipe as a base, could I add cacao powder? How much do you think? Btw, I used King Arthur flour. I haven’t tried it with cacao. I would probably do 1/4 – 1/3 cup cacao powder for the single recipe here. Yay! I’m so glad that your family liked it. Amazing recipe! I thought it needed more flour, so ai added a 1/4 more. And also added sweet coconut flakes into de batter. I have participated in a gluten, dairy, salt and sugar free project for neuphrotic syndrome patients. This recipe would be amazing if added into the recipes we used over there! o glad you liked it. Please share if you like. Thanks for stopping by to leave your feedback. Great recipe! My husband and I are on the Specific Carbohydrate Diet (SCD) and this recipe was awesome! It was rich and thick kind of like a pound cake, but so moist and delicious. I doubled the recipe and only used half the honey and it was still very sweet. Thanks for sharing this recipe! I am so happy to hear that. 🙂 Enjoy!! I would like to bake this recipe in two 5 inch cake pans. Could you tell me how long I should bake them for? I haven’t tried this recipe is smaller pans. You will definitely need a shorter baking time. Just watch them and test the center. Hope that helps. I was wondering if I could add cacao powder to this cake to make it a chocolate cake. Or maybe just melted chocolate? Let me know when you get the time! Oh! One more thing: could I add puréed banana as a sweetener instead of honey? Thanks! I plan to try bake this cake tomorrow. Really excited about it. Had a question. Step 3 under instructions mentions 3 eggs, but there is no mention of 3 whole eggs under the ingredient list. Please can you clarify. Thank you. You can see 3 EGGS listed as the 4th ingredient in the ingredient list. Hope that helps. Question about baking with coconut flour in general: would you think using just egg yolks, butter and sweetener of choice to make a moist cake by beating the eggs and the sweetener until fluffy would work if using coconut flour? 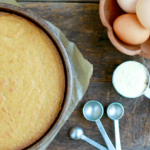 I have this recipe from my home country where it only uses yolks, flour and sugar and butter to make a moist cake (no leavening agents such as baking powder or baking soda). What’s your thought? Coconut flour is totally different than other flours. It need a lot of liquid as it is like a sponge and absorbs moisture like crazy. I think if you just used yolk, butter, and sugar, you would end up with a very dry cake. Looks like a lot of people tried this. I just did and the batter was really dry so I patted it in hoping it would cook down but it didn’t. It was as thick as butter. I can’t imagine what you did to get it to be a smooth batter. It’s hard to say what happened without seeing it. I’m guessing that there was too much coconut flour in the mix. My batter is not too thick. But coconut flour can get thick pretty quickly if too much is added or not enough liquid is added. So sorry to hear that it did not work out for you. I love this recipe. I have tried it exactly as written and again with some substitutions and it always comes out delicious. I have used coconut nectar instead of ghee and it comes out very dark, but still delicious. I have also tried adding the 2 egg yolks (that are discarded from the egg whites) to the other eggs and reduced the honey to 1/4 cup with no noticeable change in texture (though slightly less sweet). I have also tried substituting a flax egg for ONE of the eggs with good results, but trying to use more than one flax egg did not work texture wise, though still tasty. I want to make this cake for my daughter 4th birthday..but i have strict demans, pink and yellow?. Do you think it.s posible to put some beetroot juice to make it pink? And then i can easily use a mango cream for frosting. Thaks for fast feedback. I’ve thought of keeping the cake yellow, but if I add a mango puree just to be more yellowish do i need to add extra coconut flour (maybe 2-3 spoons)?. i will come back with the result of course :D.
“4. Add wet to dry and mix well to combine. I can’t really fold the soft peak egg white into doughy batter. it is either not even, or the egg white foam collapse after folding too many time. Would you please tell me what i did it wrong? I love this recipe! The perfect cake. Hi, Alexis. I have never tried to freeze this cake. I would like to guess that it would be fine, but I can’t say for sure. Please let me know if you decide to try it. I am so glad that you love this cake. I do too! This cake was so good! I ehhhh sort of changed it up and omitted all the oil, substituted Silk Almond/Coconut milk for the *real* coconut milk, and replaced the maple syrup with a little under half a mashed banana (also had to add some stevia). It rose really nicely (the texture was actually really awesome) and it tasted SO GOOD! I mean, don’t worry,I’d probably go ahead and follow the recipe to a T if i was serving it to anyone else but myself but since i just made this to eat on my own I wanted to go with a lower calorie version. Just thought I’d let people know it works without a truckload of fat (i know I know, people that eat coconut flour seem to really LOVE their fat but whatever). This cake is good. I was in need of a gluten free dessert to help me manage my sweet tooth. I topped it with a simple blackberry sauces (1 pint blackberries + zest and juice of 1 lemon + 2 Tbs sugar – all cooked together for five minutes). I cheated a little with the sugar in the blackberry sauce, but it all pales in comparison to the sweet damage I would’ve done otherwise. Thank you for this recipe. Yay! Glad you liked it. That blackberry sauce sounds so good. Thank you for sharing this delicious cake recipe. I made it with coconut oil and maple syrup options and it was very good. I topped it with the coconut cream whipped cream with honey & vanilla and then topped it off with fresh strawberries. This was my first attempt at a gluten free dairy free cake & you made it very easy. I am glad it worked out for you. I haven’t tried cutting this in half. That always makes me nervous when I have to cut a cake. 😉 I usually just make 2 if I want a layer cake. I just made this cake today. Super easy and absolutely delicious! You don’t even need any kind of topping on it, it’s that good! Yay! Thanks for the kind feedback. This cake is pretty amazing. I wouldn’t compare it with a box cake of any kind. It’s more like baked custard. The edges of the cake get so crispy, I love it! My hubs asked me to make that for his birthday every year. Thanks for sharing your recipe! I am so glad that you liked it. And your hubby too!! Made this cake today. I didn’t think it would turn out because the batter was very thick and kind of lumpy. I used my hand mixer to help take out the lumps. Well, it was great. It rose a little bit. I had a piece with some fruit and a touch of whipped cream and it was excellent. I followed the instructions and made no substitutions. So alas, much to my dispair, I have to join everyone else who said the cake didn’t rise at all (plus it was very oily). I even baked it in a slightly smaller pan, but nope, no rising. Do you know if there is any other way to make the cake rise? (I mean, a recipe that doesn’t require the egg white thing, but sugar free, suitable for someone following a keto diet, etc.)? I really had to bring a cake tomorrow to someone who is ill and following that diet, but I’m at a loss right now. Hi, there! I am not sure what to advise at this point. I make this cake frequently and have never had an issue. And many many readers have been successful as well. This cake tends to be a thinner cake that does not rise tremendously. But I would not describe it as oily. I am wondering if your baking soda is flat and old?? I love his cake. I make it almost every weekend as my hubby loves it! I have made it with honey, maple syrup and coconut sugar—all with great results. I usually add blueberries (my fave) or chopped dates for hubby. It turns out great every time. Thank you! This cake is delicious! I followed the directions to the T, used coconut oil, Bob’s Red Mill coconut flour and honey. I topped it with a coconut buttercream and toasted coconut. I was pleasantly surprised and love it very much! Thanks for a great recipe. I haven’t tried the batter in cupcake tins. I would have to experiment a bit. They don’t rise as much as I would like my cupcakes to rise. Thank you!!! This is a fabulous cake! Easy to make and delicious! I made it for a large function – two half sheet cakes (tripled the recipe for each half sheet) and iced with a coconut oil/cream cheese icing. It was a resounding success, especially among those gluten free folks who appreciated there was a choice for them. Others could not believe it was gluten free!! Thank you! How many quarts does the batter render? I usually have my batter at 2 quarts, so i can get a 9” pan nicely filled, or two 6” pans decently filled. I’m going to try baking this but I only have an 8inch spring form pan. Do I have to reduce the ingredients or can I still use the form and with the remaining batter, pour it perhaps to muffin forms? Fabulous! Followed the instructions and got a wonderful cake! I didn’t have coconut milk but used heavy whipping cream instead. I’m a huge fan of anything coconut so I will definitely have some on hand next time. This will help my insatiable sweet tooth with much less guilt ? Hi ! Tried this recipe yesterday and accidentally made 2 batches. The first time, when I mixed the eggs with oil and Vanilla extract the batter looked splitted. I thought there must something wrong, so I set it aside and started to make another one. It turned out the same, so desperately I just mixed in the dry ingredients, and the magic happened… it turned into a nice thick batter. I put it into the oven and it turn out really great. Didn’t rise much, but it was really moist. For the first batch which I set aside earlier, I added 2 tbs of dark chocolate powder, and 1 tbs of stevia powder, the cake became Choco-Coco Cake 🙂 and taste really good too. Thank you for the beautiful simple great recipe. Well…. too much cake is never a problem. I’m so glad you liked it. I love the chocolate version. YUM!! I made with allulose instead of maple but am going to use a lo carb maple syrup – with the allulose the color was off but the taste and texture was phenomenal. Since I used all I lose it wasn’t that sweet so next time will see if the sugar free syrup will help. I feel like I needed a little more zest to it so may try also with lemon or lime zest in it and some spiced rum in addition to the vanilla because it was a bit bland maybe because the sweetness of the allulose was not the same and doesn’t have the richness of the maple. I’m looking for a nutrition list for this recipe…I didn’t see one …thank you…. How can I transform this cake into chocolate version? If you do not have a dairy intolerance can you use butter and buttermilk or cream instead of coconut milk and ghee? I think ghee has a very different flavor in recipes and would like the more buttery taste. My husband is also weird about strong coconut flavors and won’t often eat things if he can taste it. The flour doesn’t bother him…But coconut milk often does. Just curious! Any change in baking time or measurements if I sub? Made this using two 6 inch pans and almond milk. Cake didn’t rise, and I think I overcooked slightly. Still tasted great though. I will try again. Wondered if OK to mix dry and wet ingredients and put aside whilst you whisk the egg whites. I didn’t mix dry and wet until I had done the egg whites. Could this have a caused the cake not to rise? I have tried quite a few of these types of recipes (not cake flour) to keep the carb count lower and most of the finished items went into the garbage. This one was DELICIOUS and moist! I added the zest of one lemon and juice of half the lemon and it was perfect. Thank you.